The subject of wheel alignment and suspension geometries is highly complex. Our goal is to provide the basics of it in order to grant you some understanding of vehicles dynamics from an engineering point of view. We will cover the subjects of suspension components, wheelarms, wheel alignment and changes in the wheel alignment. The need for all sorts of fancy engineering patents has to do with physical forces working on the car. Anyone who is fimiliar with tire traction will know that the tire rubber is consisted is little, nearly microscopic rubber fybers. Since a small portion of the tire is on the ground at any given moment, not all fybers are faced against the earth. When the tire rolls, some fybers reach contact with the road as others are being drawn up and away from it. When a fyber contacts the road, it get crammed between the road and the weight of the car pressing down on it. This deformation of the fyber makes it squeeze into the little imperfections on the road surface (no surface can ever be completly smooth). This generates grip. Whenever we accelerate, decelerate and/or steer, we produce a force defined as acceleration: When we accelerate we create positive acceleration, braking is negative acceleration. Standing still or keeping a constant speed is zero acceleration. When the wheel travels over bumps it accelerates upwards and the weight of the car creates downwards acceleration. Steering and cornering are regarded as lateral acceleration. These forces of acceleration adds to the deformation of the tire fybers. When we try to accelerate ahead, we apply torque to the driven wheels, and this torque adds a force that further deforms the fybers backwards. When we steer to the right, we move the steering wheel which turns the front wheels to the right. But, when we turn the wheels, the actual patch of rubber that is in contact with the road, naturally seeks to keep on going straight, so it refuses to turn by deforming and twisting to the left. The result is that the wheel (rim) is being pointed towards one direction while the tread of the tire is being turned a bit less. Since the tread is the one that actually makes contact with the road, the actual path the car takes depends on where the tread is pointed. This effect is called a slip angle. My point with this short lesson on tire grip, is to establish that whenever we try to make a car do something (go faster, slower or turn), we create forces that work individually on every part of the car. We will take a right turn for an example: The slip angle described above creates a lateral force (Centripetal force) which deforms the tread of the tire (slip angle), deforms the whole tire (making the sidewall sort of "collapse"), it tries to roll the car's body (making the springs and dampers compress), it puts strain that tries to move the axle on which the wheels are placed, it pushes the springs laterally and deform the wheel arms, it twists the car's chassis and it "pushes" the driver. The point of suspension design is to allow all these components to withstand these forces, so that they stay aligned relative to one another, allowing for more grip and better driveability. Note: Links are applied for images that help illustrate the point of these components. Tires are the number one determining factor in terms of car upgrades. Springs are also very important, and dampers too, but nothing is as crucial as tires. Softer tire rubber allows more flexing of the tire's fybers to take place so that more overall grip can be achieved. However, the structure of the tire itself, as a whole, is a different story. The side force of a corner wants to push the tire aside. Since the tire is hooked to the rim, it cannot be pushed aside, but rather it deforms. This can be seen in hard cornering as the sidewall of the tire seems to be crammed and the tire's face is scrubbed aside. This is not good and has to be minimized by making the tire stiffer. A tire's stiffness depands on it's structure and air pressure. The structure of the tire can be distincted into two portions: The tread and sidewall. Both are built out of several layers (plies) of nylon, rubber, steel and fabric. In diagonal tires, the layers are crossed relative to one another. This gives sufficient stifness to all parts of the tire. Modern radial tires have a seperate tread and sidewall, each built of layers facing straight. The sidewall is thin and sensitive, but the tread is very durable. With a given radial tire, making the tire's profile smaller is better. If a tire is narrow and "tall" (like in old cars), it will have a little area of contact with the road, and it would flex an awful a lot lateraly. If a tire is wide and has very little rubber between the rim and road, it will be more stable in withstanding the side force. The other variation is air within the tire. Less air leads to a softer tire and more air leads to a stiffer tire. They also have a similar effect to the changes in structure: A tire that is "too" soft or hard will not have enough rubber against the road. Too much air will make the tire recieve a narrow shape. The tradeoff in both instances is that a stiff tire and/or a tire with a low profile, will both have more grip -- but will have two disadvantages: The first has to do with ride comfort: A softer tire, or a high-profile that that places the rim further away from the road -- both provide a more comfortable ride. A low-profile tire will be less comfortable. Another aspect has to do with the transition from grip to slip. A more grippy tire tends to lose grip more sharply. The rim should be stiff enough to resist the side force and other forces that work on it. Almost all rims do that. The other job of the rim is to be light. The lighter the wheel and tire are overall, the less weight there is for the engine to turn around, for the brakes to slow down, for the steering to turn, and for the suspension to constrain. For a given radius, alloy rims are significantly lighter. A rim with wider radius is heavier and therefore has no advantage, but the size of the rim must be sufficient to hold the brakes inside it. Bigger rims can hold bigger brakes, but it's the tire that ends up doing the stopping. Spacers used to make the wheels wider (bigger "track width") are usually not recommended. They can make the tire rubb against the wheel arches under cornering, they require longer steering tie-rods and wheelarms that creates a physical leverage between the wheels and suspension. Think of a crane: You tie a heavy weight unto a cable that is placed over the crane so that the force of pulling the cable is magnified by the crane. Spacers do the same for the wheel relative to the suspension, thereby increasing suspension wear and increasing the effect of torque steer in FWD cars, where the engine torque creates a push on the steering mechanism. The advantage of spacers or, better yet, with sophisticated car design, is to extend the track width and wheelbase. Think of a car where all four wheels are placed closely toghether in the center of the car. This would not be very stable, will it? That's the idea of wheelbase. For a given car, the further the wheels are from one another and the closer they are to the edges of the car -- the more stable you will be. The closer they are -- the more they work like one big wheel. This is disadvantagous in off-roading, where a certain space and "approach" angle has to be formed to allow the front of the car to go over rocks and hills without the tin hitting the earth. The dynamic disadvantage of having a large portion of the car that sits in front of the axle is magnified if the engine is located therein. Many German cars like Audi and Opel/Vauxhaull are adjusted with the engine placed in front of the front axle. This gives the front wheels the toll of the engine's weight which is all extra weight for them to turn aside, slow down and push during acceleration. This gives the car natural understeer, and usually requires changes in roll coupling and tire pressure to balance: The car is equipped with stiffer front suspension and higher tire pressure that give it more grip to the front to cope with the extra load. I said earlier that the road is never fully smooth. In fact, it's intentionally rugged so that tire fybers could key into it. However, there are also bumps on the road. When the wheel hits a bump, except for rocking the car, it gets pushed up and away from the road. The main role of the spring is to sustain that jolt of the tire and keep it pressed against the road surface. Softer springs "isolate" you from the bumps better, but the spring also has other roles. We have covered both the aspects of tread defomation (slip angle) and the deformation of the whole tire and have specified the ways used to deal with them. But what about the body of the car? When we turn, the Centripetal force pushes the car away. It's way to do it is to try and top the car over and roll it. Since it takes a lot of force to roll the car, it usually don't really roll over, but it does recieves a "roll angle" -- the car seems to lean over it's "outside" tires. Since the wheels are obviously connected to the tire, this makes them recieve an angle relative to the road. This makes part of the tire lose contact with the road, and the part that stays in contact is the corner of the tread (where the tread and sidewall connect). There are various ways to reduce the roll angle (and likewise the squat angle when accelerating and dive angle when you brake). The springs are the main way to deal with the roll angle. When the body of the car rolls, the springs on one side compress and the springs on the other side decompress. Stiffer springs will resist this roll angle, keeping the car more level in the corner. Like with stiffer tires, the tradeoff is with comfort over bumps. In fact, if the springs are stiff enough to make the car rock over bumps, it's too stiff because it means that the car is too stiff. The racetrack is very smooth and allows to stiffen the car a lot without making the car bounce over the track. The springs and the roll angle have to with another third job: When the body of the car rolls, it leans over the outside wheels, pressing them down against the road and giving them extra grip. The "outside" wheels are therefore the critical wheels for turning (the same for the front wheels when braking). If there is a stiffer car with less body roll, it will roll faster and react more quickely and sharply to the steering. A soft car will react more progressively and with more feel. The other side is that when you make a mistake, a stiff car will take you over the limit faster and with less premature notice. A soft car will react more progressively and go over the limit more progressively, but will also recover from mistakes more progressively and less quickely. The Spring does not cope with all three tasks alike. Springs have two rates of compression: Fast bump and Slow bump. When you go over a bump, the wheel bounces up and back down rather quickely. However, when you compress it down under the body of the car as it rolls into a corner, you recieve a more progressive result. Because of that, the "fast bump" rate of a given spring and damper allows to change how comfortably the car would run on the surface, while the "slow bump" ratings would improve it's roll angle. Like with a tire, a spring's stiffness can be changed in various ways. One is the shape of the spring. Car springs are significantly wider than they are long. They are atleast four times more wide than they are long, to avoid them bottoming out in the middle. Another subject is how wide the coil is and how stiff is the steel it's made of. Furthermore, the spring does not nessecarily has a static stiffness. Many roadcars have "progressive" springs that get more "dense" as they get further away from the wheel. This way, when you drive on the road, and the spring has to compress somewhat over bumps, it can be soft enough to be comfortable. But, when pressed to the limit in performance driving, it reaches a point where it becomes stiff to allow for more performance to take place. Springs can also change the ride height of the car. A lower car will have a lower center of gravity which will reduce the overall roll angle, but this effect is less significant than stiffening the springs. Some springs are made as "coil-overs" so that they can be adjusted individually to change the ride height. Basically -- the lower, the better, so long as you don't touch the ground. The damper is mistakenly called a "shock absorber". It's also often confused for a standalone component. It is NOT. The spring we talked about above has one disadvantage: You apply force to compress it, but when you let go, the spring will bounce back and forth before returning to it's normal shape. This is professionally known as osciliation and will result in sluggish response from the car and lack of grip. The car would go over a bump and that saw up and down before again "taking a set". The damper is a brake that seeks to provide resistance to the spring and stop it from osciliating. Of course, too stiff a damper will prevent the spring from doing it's job. The downside of stiffening the springs and dampers is the reduced ride comfort. Another way to reduce the roll angle WITHOUT reducing the ride comfort is the anti-roll bar. It is simply a stiff bar that chains both sides of the car to one another. It can twist to a certain extent, thereby reducing the roll angle. But, there always is a downside. Here, the downside has to do with individual suspensions -- If one wheel hits a bump, it would make the adjecent wheel bounce too. Making the chasis of the car stiffer with bars, braces and roll cages makes the car safer and more ridig in resisting the forces that seek to twist it. This is not nessecarily comfortable and safe in road cars, and even less beneficial in off-roading, but it is beneficial in race-cars. No matter what you do, the car's body will roll sideways. The roll angle gives you some indication of how tight the cornering is. They provide steering response and a progressive car that does not go over the limit so sharply. The way to deal with whatever roll angle the car has to adjust the wheels' camber. We intentionally set the wheels so that they are NOT placed straight upside-down flat agains the ground. We set them in an angle away from the body of the car, so that when the car's body rolls and places the wheels in an angle, this angle will be opposite to the camber of the wheels, and the will neutralize one another so that the tire will eventually be placed straight against the road surface. The tradeoff here is for grip and tire wear on the straight. Camber has another effect. It makes the wheel steer. This is complex to explain, but negative camber will make the car stable but slightly resistant to turn, while positive camber will make the car very sharp in response to steering, but can cause the car to oversteer and turn much more sharply than required, making the car spin. Castor is the placing the tire longitudally. A wheel with castor will be titled backwards so that the point of contact with the ground will be behind the point where the steering rod contacts the tire. Remember the point on how the tire's rubber fybers get in contact with the road and start to generate grip. This does not occur in one blow. When the fyber first comes in contact with the ground, it's still not fully against it and is not carrying the full weight of the car. At a certain point, the fyber is flat between the rim and road, reaching maximum flexing and generating maximum grip. Changing the castor changes the exact point in which this happens. This changes the amount of grip but also changes steering feel. After the point of maximum load on the fyber, it starts coming off of the road surface as the tire keeps on rolling. Is a corner, the wheel generates a slip angle that is expressed by how far the fybers twist to the side. As the fybers start folding back into line, they form a force called "aligning torque". This force makes the steering wheel return to straight and also gives a feel of resistance through the steering wheel. More castor gives more aligning torque and more steering feel, but also a steering that is harder to turn. Castor also changes the graph of the Camber. Explaination: Camber is not static. The more we turn, the more roll angle we develop. So the wheels are adjusted to recieve more and more camber when they are turned. More castor means more Camber when the wheels are turned. Toe is a steering angle. It can either be Toe-in or Toe-out. In Toe-in, the wheels are turned one towards another. This makes them want to roll towards one another, which makes the car unstable. Toe-out will make the wheels point away from the car and from one another, which makes the car stable but again creates understeer that might make the car resistant to turn as tightly as required. Let's go back to springs. There are various types of springs and several ways of placing them. The earliest form of springs were not the modern steel coils used nowadays. They were "leaf springs". These are layers of flexible metal that are tied in both edges to the bottom of the chassis, and they are chained in the center to the axle of the wheel. This is very effective for making the spring progressive, by combining several "leafs" of metal that have different spring stiffness rates and different lengths to create more progressive springs. The combination of different layers and the friction between them adds to the rigidity of the spring. These springs are simple and cheap, and are very easily connected to the chassis with very few rubber bushings. These springs have lots of disadvantages: They reduce the ride height around the wheel, they are large and heavy, and they cannot keep the axle from moving over the place in a turn. They provide bad ride quality because their form makes it harder for them to reach full compression. There are various ways of placing these springs. 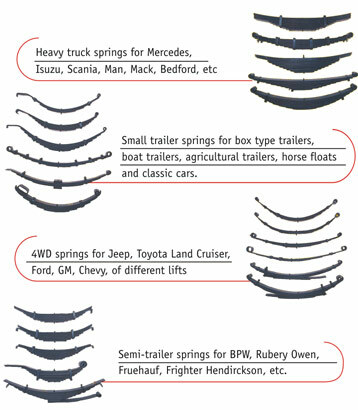 The most popular way is spring under, where the leaf spring goes under the axle, constraining it and protecting it. There are also various ways of chaining it to the car. The leaf has the shape of an arch, but some cars, mainly used for off-roading, will have two opposite leafs, forming a full circle between the chassis and the wheel. The other type of spring is a stiff bar called a strut which can twist on an axle when the wheels hit a bump. Still, the most popular form is the spring because of advantages in terms of space, cost and effectiveness. They can be connected to an axle in various forms. One popular form is with three arms, two connected to the sides of the axles from above, and one in the middle and below. This allows to keep the axle fixed in a corner. a 4-link formation is used by some off-road cars, with four arms that constrain the axle between them. The two upper arms prevent the axle from moving forward, the two upper ones prevent it from turning, and the combination prevents it from being pushed aside. To prevent the axle from being pushed laterally, several methods have been applied over the years. The first countermeasure was the Panhard rod, which composed of a bar placed in an angle relative to the axle. This stops the axle from recieving an angle that makes the wheels recieve unnessecary camber. An improved version is the Watt's linkage, constructed in the form of two arms that are crossed over the car between the axle and chassis. The third way is the de-dion formation, where one wheel is connected to a tube and another -- to a bar that runs into the tube. When the axle tries to sway, the bar that also tries to sway is constrained by the bar. The advantage here is that the two wheels are somewhat seperate, even though there is an axle. Remember I said that the body roll of the car moves the tire relative to the road? Remember I said the tire is intentionaly titled in the opposite direction so that once the body rolls it would be flat upside down against the road? Well, there is more to it. Modern cars have wheelarms that can give the wheel some independence, allowing it to not move even though some body roll does occur. This is a formation used to the front wheels of most FWD cars, where the damper sits inside the spring. This gives the spring extra rigidity which allows to place a longer spring that can compress more, all within a smaller space. This is a form of a arm that holds a wheel and connects it to the spring and damper. The wheel is held by two A-shaped wishbones of steel. The freedom of movement between them ensures that the wheelarm twists so that it is always flat against the road -- during body roll, squat and dive. Professional single-seater race cars, which have open wheels, have a suspension geometry based on a double-wishbone formation, where the wheels are held by multiple arms that allow to place the springs almost vertical to the tire, allowing to place car very low relative to the ground while still having long springs. A less efficient formation where the wheels are held by arms vertical to the axle. These are very good in keeping the axle in place. But, in a corner, the wheel would be forced to lean with the car's body. Nowadays, semi-trailing arms are used, and are placed in an angle that allows for some freedom that keeps the wheel flat against the road during certain amounts of body roll. Rear trailing arms had the problem of having sharp lift-off oversteer. When deceleration was generated, the structural weak link of the rubber bushings that connected the arm to the car's body would twist under the force, "ditching" the rear wheels which would be moved slightly backwards. The suspension geometry would create toe-out that will create oversteer. The Weissach axle was based on two semi-trailing arms that could flex and move relative to one another. Under deceleration, one arm would seek to "rotate", but the other arm would keep the wheel itself fixed and unchanged by the movement of the one arm. The suspension arms are connected to the chassis and wheels by rubber bushings. The bushings are also placed under strains that make them also change the alignment of the arm and wheels, making an unplanned change to the wheel alignment. Upgrading the bushings allows to minimize these effects. In a turn, the outside wheel takes a wider radius than the inside wheel. The Ackerman steering formation makes the inside front wheel turn tighter than the outside wheel. This produces more stability in normal cornering. But, in a race the car is constantly pushed to the limit. Hence, any attempt to turn the inside wheel beyond the maximal slip angle will reduce performance. That's why racecars have anti-Ackerman steering where the inside wheels are turned LESS. This is used to describe a suspension where the rear wheels recieve a toe angle that makes them steer somewhat in turns. Active 4-wheel steering makes the rear wheels toe-out and turn towards away from the corner, which gives more stable high-speed cornering and, in slow and sharp cornering allow for the rear wheel to toe-in and turn into the corner which helps to "rotate" the car into the corner. Sometimes, cars that are designed to toe-out in the rear under squat can create "compliance oversteer" by steering the rear of the car and rotating it -- this is not real oversteer and should not be considered as such. Like with compliance steer, bump steer is the tendency of a wheel to change it's toe angle when driving over a bump. Some cars also have roll-steer, the tendency of the inside wheel to recieve a toe angle and steer upon cornering when a roll angle reduces their traction. These effects can be good in road cars, but neither of them exist in racecars, which are being driven to the limit constantly. Bump steer is created by changes in the rigidity of the suspension and steering tie-rod. If the tie-rod does not swing in the same arc as the suspension, the wheel will have an increase or decrease in toe and will result in a slight steering effect. One solution is to increase the ridigity of the steering tie-rod by connecting it to the wheel's knockle from above ("hi-steer") rather than below. This page was last modified on 2 January 2011, at 09:53. This page has been accessed 1,054 times.